A complicated legal landscape and changing attitudes toward marijuana use have employers have taking different approaches to testing employees. Some companies have stopped testing for cannabis, while others only test employees in safety-sensitive positions or provide job accommodations to medical marijuana users, attorneys say. Pro-worker decisions in Del., R.I., Conn., Mass. Companies should pay serious attention to legal protections for employees’ medical marijuana use in light of recent pro-worker court rulings, management attorneys told Bloomberg Law. A Delaware state court allowed a former Kraft Heinz Foods Co. employee to move forward with his lawsuit alleging the company violated the state’s medical marijuana law by sacking him for a positive drug test. That ruling, in December, followed decisions in three other states in favor of workers who either were fired or not hired because of their medical cannabis use. The complicated patchwork of state requirements makes it difficult for multistate employers to adopt a single, nationwide approach, attorneys said. The law and public opinion on marijuana have evolved significantly since 1996, when California became the first state to permit the use of the drug for medical purposes. Thirty-two states and Washington, D.C., now allow medical marijuana, and 10 states and the nation’s capital have legalized recreational use. Some 62 percent of Americans say cannabis should be legal, double the share who favored legalization in 2000, according to a 2018 Pew Research Center poll. Prior to 2017, courts roundly rejected worker lawsuits challenging adverse employment decisions related to medical marijuana use, including state high courts in California, Washington, and Oregon. But that year, a Rhode Island state court ruled that a fabrics manufacturer couldn’t refuse to hire a paid intern who legally used medical cannabis, even though she wouldn’t pass a drug test. A federal court in Connecticut ruled in 2018 that the state’s medical marijuana law prohibited a health-care company from rejecting a job applicant who failed a pre-employment drug test. Delaware, Rhode Island, and Connecticut are among the 13 states that have anti-discrimination protections in their laws specifically for medical marijuana patients. Some of the other states with such safeguards are New York, Pennsylvania, and Illinois. Although Massachusetts’ medical marijuana law doesn’t contain explicit employment protections, the state Supreme Court in 2017 granted them through the state statute prohibiting bias against disabled workers. The nature of the applicant or employee’s job is important when a company is deciding whether to test and if so, how, with safety being the key consideration, said Kathryn Russo, an attorney with Jackson Lewis. “Drug and alcohol testing is all about safety,” she told Bloomberg Law. Given the complex legal landscape and the changing attitudes toward marijuana use, employers have taken different paths, attorneys said. Some companies have scrapped tests for cannabis altogether, while others only test employees in safety-sensitive positions or provide job accommodations to medical marijuana patients, they said. Other factors can play into employers’ calculations. For example, a manufacturer in a state with legalized recreational marijuana found it couldn’t hire enough workers when it was screening for marijuana use, said Michael Clarkson, an attorney with Ogletree Deakins Nash Smoak & Stewart. “My advice was to stop pre-employment testing and ratchet up testing for cause,” Clarkson told Bloomberg Law. State law isn’t an issue when there’s federally mandated drug testing. The U.S. Department of Transportation, for example, requires testing for workers who operate commercial vehicles, including pilots, bus drivers, and train engineers. More legal safeguards for medical marijuana users could be on the way, said Faye Caldwell, an attorney with Caldwell Everson who specializes in workplace drug testing. 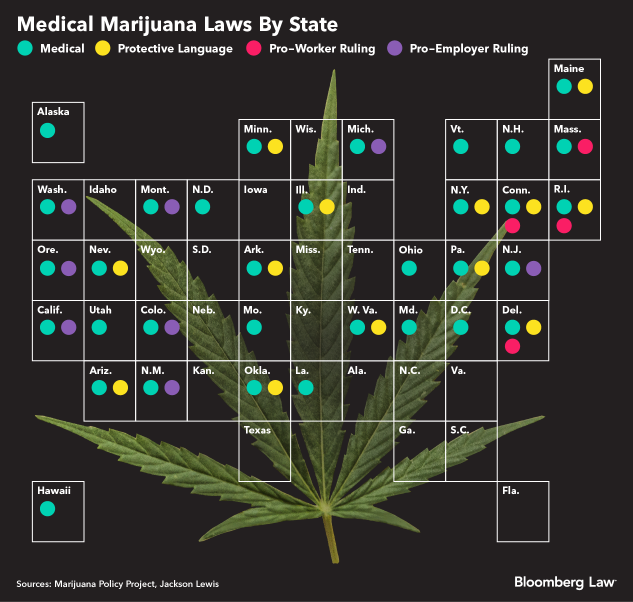 “There’s clearly a trend to include explicit employment protections as medical marijuana laws are passed or amended,” Caldwell told Bloomberg Law. The Massachusetts Supreme Court ruling recognizing protections under state law forbidding disability discrimination creates the prospect of similar rulings elsewhere, Anthony Califano, a Seyfarth Shaw attorney involved in the firm’s marijuana law practice, told Bloomberg Law. Worker attempts to find legal protections through other routes have thus far failed. The Colorado Supreme Court, for example, ruled in 2015 that the state’s “lawful activities” statute didn’t prohibit Dish Network from firing a worker for failing a drug test. Medical marijuana doesn’t qualify as a lawful activity in that instance because it’s illegal under federal law, the court said. However, other courts in states with similar protections for off-duty conduct might find that they protect medical cannabis use, said attorney Alisa Arnoff of Scalambrino & Arnoff. While many of those lifestyle laws specifically apply to tobacco use, statutes in states like Illinois and Minnesota are broader, Arnoff told Bloomberg Law. In Arizona, a former United Parcel Service Inc. sales director filed a lawsuit last year claiming the federal Americans with Disabilities Act protects medical marijuana use. But the plaintiff has abandoned the ADA claim and has focused on the anti-discrimination language in the state’s medical cannabis law, according to a January filing.